We went to see off my sister today. Every time she leaves, there are emotional scenes enacted …it happens naturally. My mother is the torchbearer and we follow suit. This time, as always, we had promised to part on a happy note. But heart rules over the head - quietly and definitely. There were smiles with tears rolling down in perfect symphony…..the more we feigned smiles the greater was the velocity of the tears and, in the process of hiding our emotions from each other, we ended up crying and laughing at the same time quite till the train whistled and slowly chugged out of the station. On our way back, there were fresh fruits being unloaded in the fruit mart. It was a treat to the eyes …such beautiful colours of nature. Oranges, kinnows, black and green grapes, red strawberries, cape gooseberries, apples, bananas et al. My son loves grapes. And we bought both, the green and black ones. The reports of indiscriminate use of pesticides sometimes dithers us from buying these lovely fruits and we generally end up buying the ones with thick inedible skins where it feels (at least mentally) that the dangerous chemicals must have penetrated minimally. 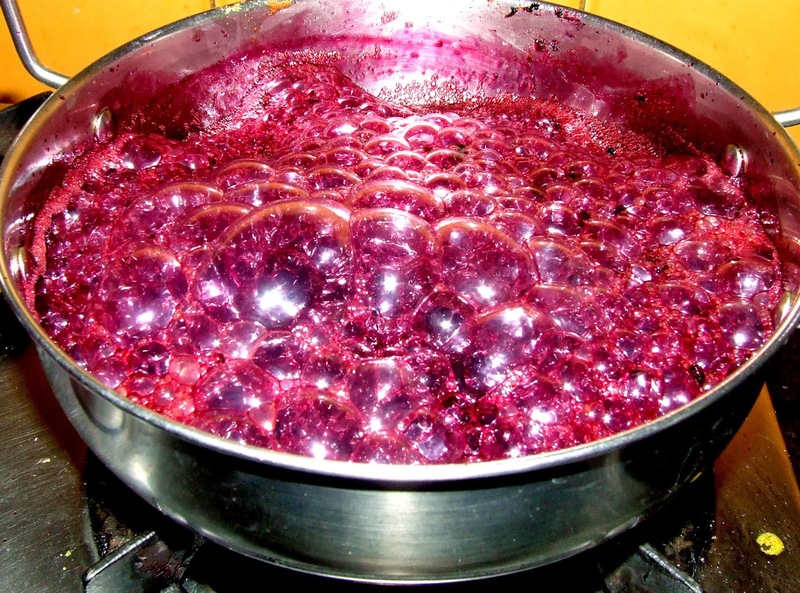 I washed the grapes in running water, soaked them in salt water and later soaked them in water with white vinegar. 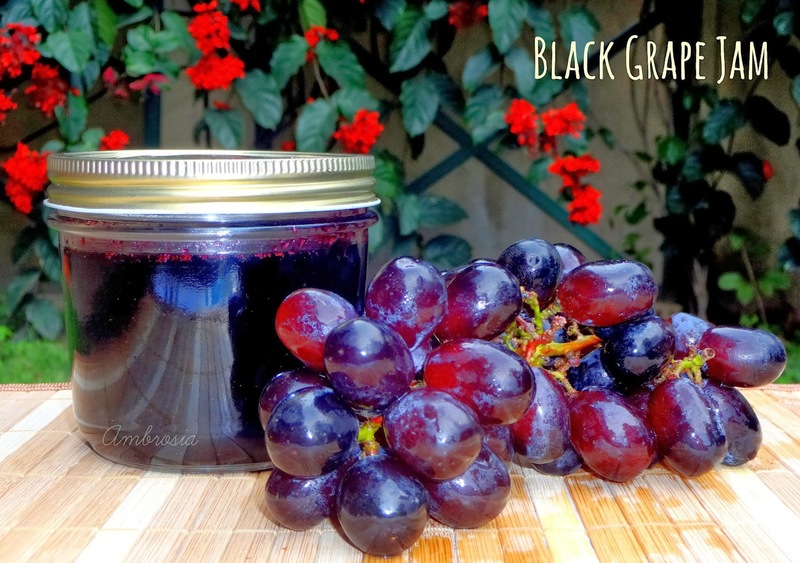 I used the black grapes to make a small batch of Black Grape Jam. Wash the grapes thoroughly. Measure them in a standard 240ml cup. For every cup of grapes, add juice of an orange. Blend them with the juice. Measure the grape and orange mixture. The black grapes are very sweet. For every cup of this mix, add ¾ cup of white sugar and one tablespoon of lemon juice. Cook this mixture in a thick bottom steel wok. Let it come to a rolling boil. Now cook on medium heat till it becomes thick and coats the ladle thickly. Keep stirring the the jam to avoid burning. Turn off the heat when it reaches jam like consistency. The jam will keep thickening after you remove it from heat. While the jam cools, sterilize the bottles. Place the washed and dried bottles with the lids in the oven. Set the temperature to 100 degrees and set the timer to 10 minutes. Remove the bottles and their lids from the oven. Ladle hot jam into the jars leaving ¼ inch headspace. Secure the lids tightly. I love grapes, but I'm often put off by the pesticide issue too. This jam looks delicious! Your post reminds me of the tearful times when I would come back from my Summer Vacation from Punjab. My cousin sister and I would never want the fun to stop and would cry liberally as if getting separated for a life time. We still do the same. The jam looks gorgeous and I am planning to make some for Vaanya. Loving the vibrant colours! So pretty... you are making me want to try my hands at jam making.. the ingredients looks so simple and your process seems appealing. Will give it a try some day... Very pretty and your write up made me smile :) Family times are always hard to let go off! I'm also, always worried about pesticides on grapes & berries and little one loves these two. Started using vinegar bath from past few months, may be should add the salt bath also. 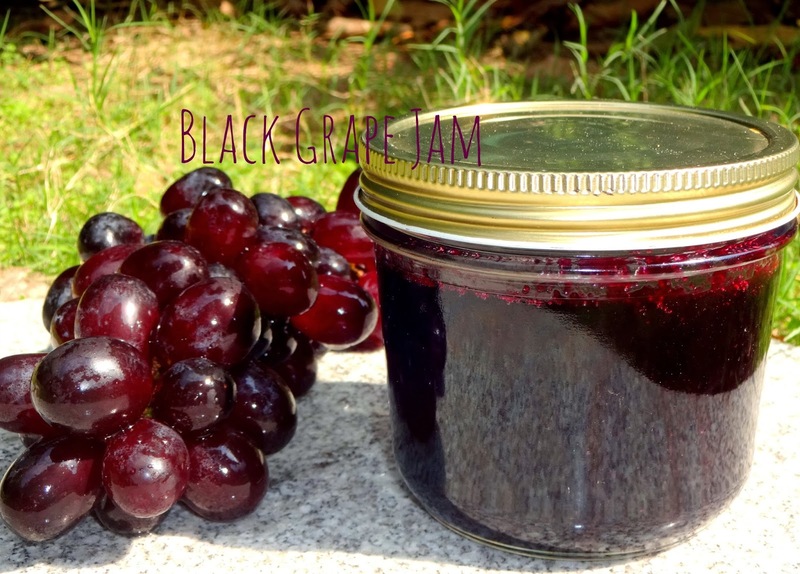 Your grape jam looks very good and coincide with my intentions of making one...... over the weekend my older one while having black grape jam(rare event in my house) with bread asked me did u made this & that got me into thinking that I should make some. 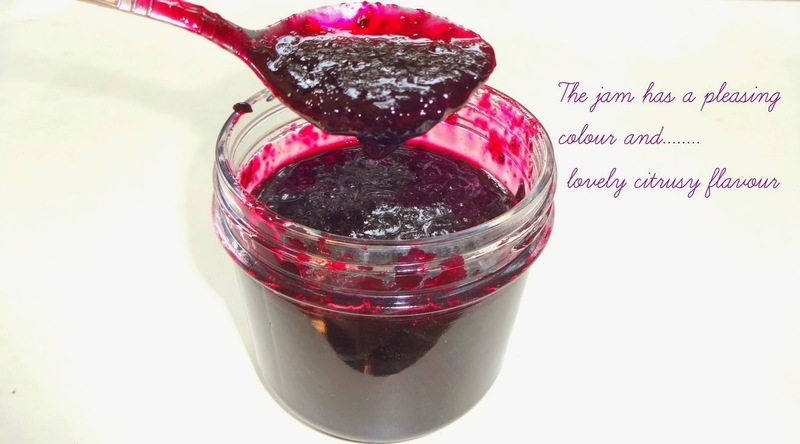 Hi Namita, I tried your black grape jam recipe yesterday, and it turned out yummy! Everyone in my family loved it. Thanks for this recipe. Hello Aditi, It is a pleasure to hear from you. Thank you for trying out the recipes and for your feedback which always makes me happy.